These cargo pants feature 6 pockets for maximum storage: 2 front pockets, 1 interior, 1 back and 1 double cargo pocket. Interior drawstring, zipper fly and an accessory D-ring on right leg. Approximate inseam - size L - 32.5". 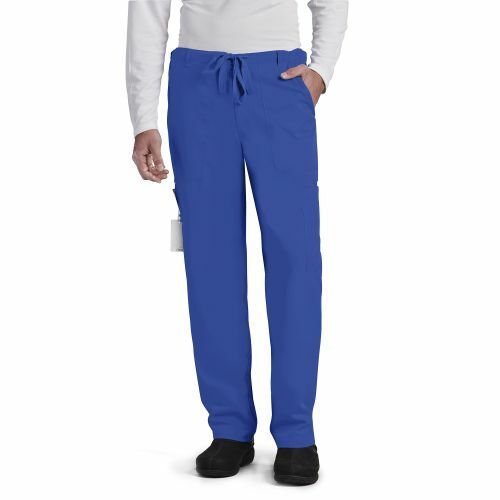 The Grey's Anatomy 0203 men's utility scrub pants are the ultimate choice for efficiency and comfort. Feature 6 pockets for maximum storage: 2 front pockets, 1 interior , 1 back pocket, and 1 double cargo pocket. There is a sturdy inside drawstring, zipper fly and accessory D-ring on the right leg for your convenience.